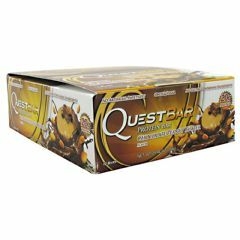 AllegroMedical.com presents The Quest Nutrition Quest Natural Protein Bar - Chocolate Peanut Butter Protein Bar Gluten Free. They said that this protein bar couldn't be made, but we finally did it. It's delicious food packed with protein that makes no compromises. Just read our ingredients and you'll see. Gluten Free. Protein Blend (Whey Protein Isolate, Milk Protein Isolate), Isomalto-Oligosaccharides (Prebiotic Fiber), Peanuts, Water, Erythritol, Cocoa. Contains less than 2% of the following: Sea Salt, Steviol Glycosides (Stevia), Lo Han Guo, Natural Flavors. Contains: Peanuts and Milk Derived Ingredients.